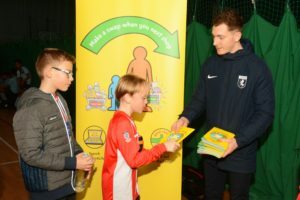 Footy-mad kids from Kent and their families will be encouraged to cut down on sugar thanks to a new partnership between the Kent FA, Kent County Council (KCC) and the NHS. Football clubs across the county are being asked to run ‘Sugar Smart Tournaments’ this year, as part of a new Change4Life campaign by Public Health England (PHE) to help tackle growing rates of childhood obesity. Kent FA are working with public health experts at KCC to promote the scheme, which will encourage clubs to offer fresh fruit and water in place of fizzy drinks, chocolate and sweets at their annual youth tournaments to show their commitment to the health and wellbeing of their youth players and their families. According to PHE, on average, children are consuming eight more sugar cubes every day than the recommended amount, equivalent to around 2,800 excess sugar cubes per year. Children have already exceeded the maximum recommended sugar intake for an 18-year-old by the time they reach their 10th birthday. Recent data show childhood obesity has reached alarming rates. According to figures for 2017/18, nearly 21 per cent of four to five-year-olds are overweight or obese in Kent, increasing to 33 per cent in 10 to 11-year-olds. Overweight or obese children are more likely to be overweight or obese as adults, increasing their risk of heart disease and some cancers, while more young people than ever are developing Type 2 diabetes. Excess sugar can also lead to painful tooth decay, with around 16 percent of five-year-olds in Kent having tooth decay. a higher-sugar breakfast cereal (e.g. a frosted or chocolate cereal) for a lower sugar cereal, to cut back from three cubes to half a cube per bowl. While some foods and drinks remain high in sugar, many companies have reformulated products such as yoghurts, breakfast cereals and juice drinks, meaning these swaps are a good place for families to start. Making these swaps every day could remove around 2,500 sugar cubes per year from a child’s diet, but swapping chocolate, puddings, sweets, cakes and pastries for healthier options such as malt loaf, sugar-free jellies, lower-sugar custards and rice puddings would reduce their intake even more. Kent FA Youth Fustal League.